What is Tourmaline, What color is it & Where is it Found? When one hears the term “gemstone”, he or she generally thinks of a diamond, a ruby, an emerald, or perhaps even a sapphire. However, the average person will not picture a tourmaline simply because this beautiful stone is not as well known as some other gems. Not only are tourmalines gorgeous, but they are also available in a wide range of colors, thus making it suitable for many types of personalities and skin tones. Naturally, there are many questions regarding tourmalines. Here are just a few of the most frequently asked questions about tourmalines. A tourmaline is a semi-precious gemstone that comes in more colors and color combination than any other gemstone, staying true to its name, which comes from the Sinhalese word “turmali,” meaning “mixed.” Due to the wide range of colors, tourmalines are often mistaken for many other gemstones. For instance, numerous stones found in the Russian Crown jewels from the 17rh century believed to be rubies are actually tourmalines. Tourmalines are crystalline boron silicate minerals that contain various elements including iron, sodium, magnesium, potassium, aluminum, and lithium. Tourmalines originate from several locations worldwide. Tourmalines are gemstones that are used in jewelry as well as in electronics. Green tourmaline is the most common type of tourmaline found, and is believed to strengthen the immune system of the wearer as well as to provide one with positive thoughts. Black tourmaline on the other hand can be used as a natural insecticide and can relieve one from arthritic pain as a result of its electromagnetic properties. There are no proven medical uses for this stone but nevertheless; many love it for its enchanting colors and vibes. There is something about colorful gemstones that draws people’s attention again and again. Tourmalines have a bit of an advantage since they offer such a large variety in terms of color, size, and price. Those looking for a red stone can be as satisfied as those in search of the perfect green gem. All in all, the tourmaline has much to offer and makes a fabulous gift. While tourmalines are mainly used for jewelry purposes in this day and age, there were and are, other uses as well. In the 19th century, chemists used tourmalines in their experiments. They found that by shining rays of light onto the surface of a polished, cut tourmaline, they were able to divide light. Tourmalines are believed to have a healing power and are used by some to detox the human body. Aside from aiding the detoxification process, tourmalines are used to improve one's alertness, relieve stress, and strengthen the immune system. What color is a tourmaline? This fabulous stone is found in colors ranging from colorless to black and displays many shades from pastels to deep hues. 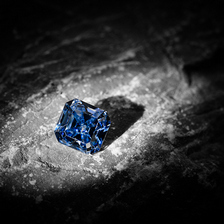 More than one color can be found in a single stone making this gem truly remarkable. There are several known tourmaline varieties. These include rubellite, indicolite, chrome, bi-color, watermelon, canary, Paraiba, cat’s eye, and color change tourmaline. Rubellite varies from medium red to a deep red and is similar in color to a ruby. 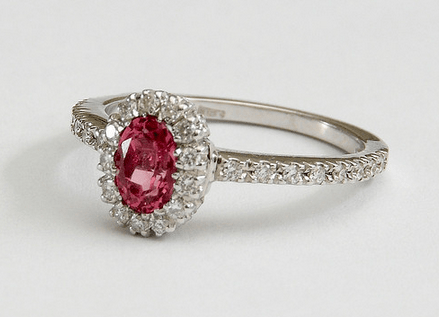 Like a ruby, it is quite rare and among the rarest forms of tourmaline. Indicolite, the deep blue to bluish green variety of tourmaline, is another rare type of tourmaline. Chrome tourmaline is green, but different than the regular green tourmaline. It owes its color to chromium found in the stone. 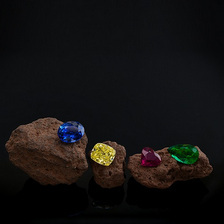 Bi-color tourmalines are those that consist of several colors. There are many possible color combinations found in tourmalines. Watermelon tourmalines, like their names, are stones with a green skin and a red core. When cut into a slice, the stone resembles a watermelon piece. A canary tourmaline is a bright yellow stone that originates from Malawi. 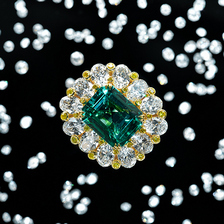 Paraibias are rare blue-green tourmalines that contain copper. They are usually found in very small sizes and demand high prices. Cat’s eye tourmalines are often found in green. Color change stones are tourmalines that change from green to red in incandescent light. Bluish-black to black tourmalines are a result of the iron present within the stone whereas stones with magnesium tend to be anywhere from yellow to brown. Tourmalines with high levels of lithium can be practically any color, including pink, red, yellow, green, and blue. An unusual and rather sought after type of tourmaline is the “watermelon tourmaline,” named for the unique natural blend of three colors, pink, white, and green, which appear in rings just like a watermelon. Stones with very clear borders between the colors demand especially hefty prices. This colorful stone, which is one of October's birthstones, is found all around the globe. Significant deposits have been found in Pakistan, Afghanistan, Burma (now Myanmar), Sri Lanka, Russia, the United States, as well as locations throughout Africa. A tourmaline can be just the right thing to spice up your jewelry piece or jewelry collection without causing too much damage to your bank account. Finding out all of the relevant information prior to your purchase can help you land the perfect tourmaline for you. Tourmalines are beautiful gemstones, but they are not as well known as precious gemstones such as emeralds, diamonds, rubies, and sapphires, or other gemstones like opals, turquoise, and amethysts. Nevertheless, these stones are truly stunning and look wonderful when set in various jewelry settings from earrings to bracelets to necklaces to rings. Since tourmalines are found in so many colors, they can create many different jewelry styles. Take a look at some of the most popular tourmaline jewelry styles around today! When the colorful crystal stones are set upon gold or platinum they result in classic and sophisticated jewelry almost comparable to diamond jewelry. Though they are not colored diamonds, tourmalines display beautiful colors, turning a refined ring into a truly enchanting piece. Whether it is a pink heart-shaped tourmaline pendant necklace, a pair of green tourmaline stud earrings or a magnificent purple tourmaline ring, there are endless elegant tourmaline jewelry styles for every taste and budget. If you are a fan of colorful gemstones but do not relate to “fancy” jewelry styles, tourmaline jewelry offers a great range of more casual designs. The stone can be cut and polished in many ways leaving the final result ranging from a glittering crystal stone to a flatter, wider, less shiny, and more earthy stone. Such styles can include large chunky necklaces consisting of single or multi colored tourmaline stones as well as a pendant necklace showcasing a very large tourmaline. The “watermelon” tourmalines, with an inner pink color and outer green color are perfect choices for more casual jewelry pieces. This type of gem looks terrific as a ring or a pendant. Tourmalines make wonderful youthful jewelry pieces thanks to the wide color selection. Young people as well as older individuals in search of jewelry with a young vibe are often looking for jewels that display lots of color. It is cheerful, trendy, and makes a statement. 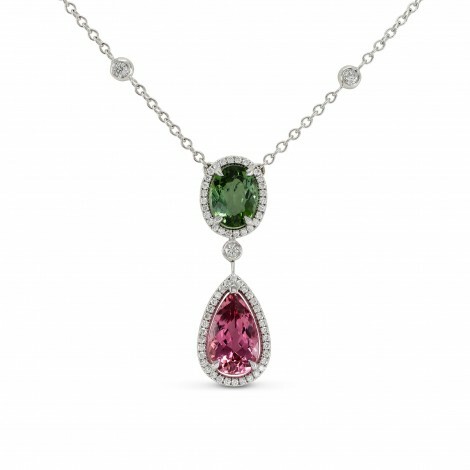 By combining several tourmaline colors together you get a very youthful jewelry piece. It can be a multicolored flower pendant, consisting of the various colored tourmalines, a colorful beaded tourmaline necklace, or a bracelets set with a few different colored tourmalines. Pink and green make a great combination, as do rainbow colors. Many people love jewelry but do not appreciate the glamorous look of it all. Some prefer simple pieces that end up being either synthetic or very invaluable. However, “bohemian” styled tourmaline jewelry allows one to have a little from each world. Tourmalines are gemstones that can be quite valuable, and though they absolutely can be glamorous, they can also be used to create very earthy, modest, and carefree styles. Large tourmaline beaded necklaces, antique styled rings, chunky bracelets, and unique-shaped multi-colored tourmaline earrings are just a few examples. Not every gemstone can suit so many styles and tastes like the tourmaline. Many of the beautiful colorful stones you may come across could actually be tourmalines and you would not have even known! It is a great option for fabulous jewelry pieces.